Now, May is about to make her biggest gamble yet, and whatever happens, it is likely to be her last as Prime Minister. Amid howls of protest from her own Conservative ranks, May is seeking a compromise Brexit deal with the opposition Labour party. Talks began last week and will continue over the next few hours and days to try to agree a plan that can be backed by a majority in the House of Commons. The timetable is tight. The Prime Minister needs a new deal to present to European Union leaders at their summit on Wednesday. If that plan is rejected by Brussels, the UK is leaving the EU without a deal on Friday. Until last week, May had ignored calls to reach out across the Commons to seek a compromise, preferring instead to try to persuade the hardliner Brexiteer faction of her own party to come round to supporting her original deal, which was struck with Brussels all the way back in November. Yet dozens of them remained opposed, and her deal has been defeated three times in Parliament by both Tory and opposition lawmakers. May has slowly reduced the margin of loss with each successive vote, but there is simply not enough support — or time left on the clock — to keep pressing the same deal. So May had no choice but to open talks with Labour, given that the alternative was to contradict her own position and the will of Parliament by accepting an economically damaging no-deal Brexit. But the specter of her striking a bargain with Jeremy Corbyn, regarded by Tories as a hard-left Marxist, has caused outrage among some ministers and MPs, particularly those who are preparing to stand for Conservative leader when May eventually steps down. Despite the backlash, the Prime Minister is holding firm. On Saturday night, she issued a statement insisting she had no choice but to compromise with Labour, because otherwise Brexit would “slip through our fingers” and never happen at all. 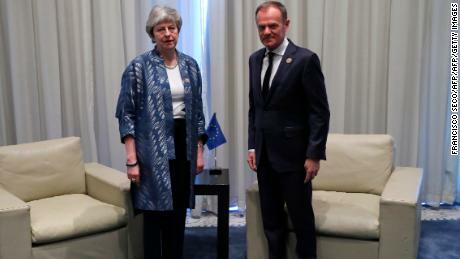 As it is, a long delay is already on the cards: this week May is asking for an extension to the Brexit deadline until June 30, and under the terms of the so-called “flextension” of up to a year proposed by European Council President Donald Tusk, the departure date could be even later. By sticking to her strategy of holding talks with Corbyn, May is risking a civil war in her own party. In those talks, Corbyn and his allies have made clear the Prime Minister needs to give more ground — particularly on the subject of a future customs union with the EU after Brexit. May’s original deal already included a customs arrangement of sorts, but Labour wants the government to go further. In the end, it could come down to finessing the words. The Brexiteer cabinet minister Andrea Leadsom, when asked on the BBC on Sunday whether she would support a customs union in a new deal, said “it depends what it means … we can’t be purist about it. We are at the point where Brexit is slipping away altogether … Provided we are leaving the European Union, it is important that we compromise, and it is through gritted teeth.” Not all of Leadsom’s fellow Brexiteers agree. On the other side, Labour maintains that the Prime Minister needs to make more concessions. In her statement on Saturday, May left the door open to a customs union — and to a second referendum on Brexit — by conspicuously leaving those proposals out of her list of red lines. Ending freedom of movement by people from the EU to Britain, a position on which both the government and Labour agree, remained in there. This is the fertile ground for compromise. 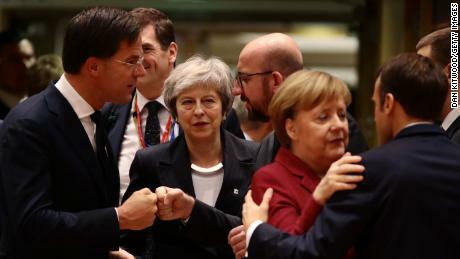 A new deal that contains a form of a customs union could pass the Commons this week — before Wednesday’s EU summit — as it could gain the support of Conservative lawmakers loyal to May, as well as Labour and other opposition parties. Yet it would cause outrage among the Brexiteer wing of her party, as well as among rank and file Conservative activists and members, many of whom are reportedly refusing to campaign for or donate to the party. May’s Conservatives are on the brink. By embarking on this compromise, the Prime Minister is, then, about to gamble the future of her party — from grassroots to MPs — as well as the unity of her cabinet on a last-chance bid to deliver Brexit. If this fails, then everything fails: Brexit, her premiership and her party. She would have to quit and possibly even call a general election. But if she succeeds, she will have finally achieved what she pledged to do when she became Prime Minister: deliver Brexit. It will have come at a great personal and political sacrifice.